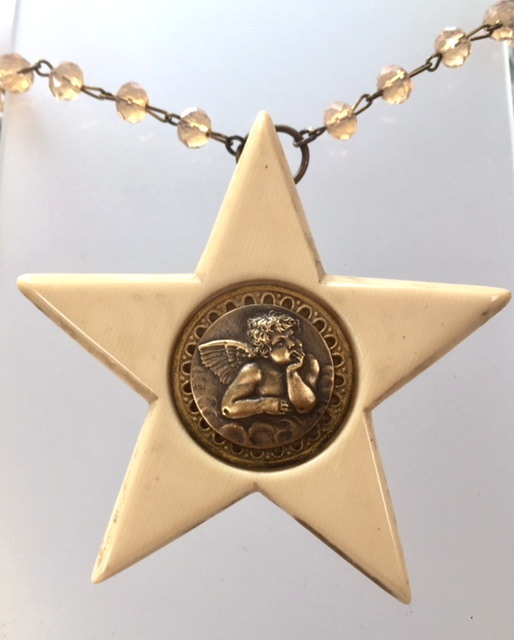 This superb French Star Star shaped C1920's Ivorine or French Ivory, (an early bakelite) Medallion with a glorious Silver Raphael Angel is a rare find indeed, a French crib medal for protection. I suspended it from glorious Faceted Blush Crystal Beads. If you cherish Angels, this is a must have piece for your collection!!! Necklace is 34" long and medal is 3 3/8" wide.